“Wow I don’t even remember him being that big!” This is a direct quote from Nicole David Mercer, our son’s lovely wife. She tells it like it is! Shrinking Man and I had a good laugh! The “Shrinking Man” slides down the scale AWAY ahead of his Christmas goal! 30 lbs in less than 90 days with NO EXERCISE! That’s a loss of .33 lbs. per day! 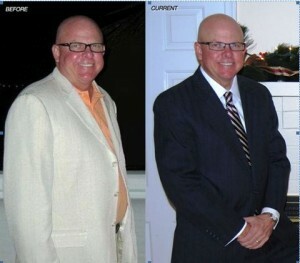 Discover his favorite recipes & follow his progress at CLL! Yes indeed – losing weight the low carb way is easier than people think! What made it easier for me was your Fat to Skinny book! Everyone should read it! I even list your book as a must read as a highly educational and motivational tool on the CarbLightLiving Program page. You must try Julian Bakery low carb breads. One slice of the Smart Carb 1 bread has 109 calories and 1 gram of net carbs. It is really delicious but a tad pricey. It is available at some local stores or online at http://www.julianbakery.com. also might try giving up wheat, see the new book, Lose the Wheat, lose the Weight, about the obesity epidemic that connects it to the “super” wheat the US started using in the early 80’s. Very enlightening read! Thank you for the suggestions. I am going to order the book. I am sure it is highly informative, and people need to know what is going on.